With each passing day, people are beginning to focus more and more on the environment. Climate change presses some serious concerns, and individuals are hoping to lessen their impact on the world by changing some of their energy sources to a more renewable energy option. If you are looking for the top ways to save the environment through your own energy use (or just to save money), we have compiled a list of some of the top ways you can do just that. There are a few things you can do to save money when it comes to energy consumption. For example, you can adjust the thermostat down a few degrees in the winter and up a few in the in summer to save on your heating and cooling costs. Another option is to choose compact fluorescent light bulbs when your older bulbs burn out. Try your best to unplug anything when you aren’t using it, or find a smart power strip that can actually detect when electronics and other appliances are not in use. This can cut additional energy use. When you can, try to do your laundry in cold water. While this may not seem like a big change, as much as 85 percent of the energy used to wash clothes in the washing machine is used just to heat the water. Also, hang your clothes to dry when you can. This saves energy from the dryers. The amount of water you use also takes a big part of your energy consumption. By taking shorter showers, you can reduce your water use while lowering your water and heating bills! You could also consider installing a low-flow showerhead. These don’t cost a whole lot, and the water and energy savings usually will be paid back in no time with your savings. For those of you who enjoy gardening, try to choose drought-tolerant plants for your garden. These plants don’t need much watering, so they are sure to last a long time without constantly draining your water supply and increasing those water bills. While it isn’t easy to get rid of your car completely, cutting down on driving whenever possible can really help you save money and energy. For example, walk or bike to work if you live close by. Not only will this help with gas, but it will also improve your health. Also, if you have the option to telecommute, that is a wonderful way to save energy and gas. We are fortunate in San Jose that the weather allows us to have these options from time to time! If you have friends or family who work either with you or near your work, try to set up a carpooling system. While it may not work every day, it might be just enough to help you save money and do a little something extra for the environment. If you eat meat, that’s totally fine—but you should try adding one meatless meal a week. Meat costs quite a bit at the store, and it costs quite a bit environmentally. If you do eat meat, try your best to select the locally-raised and humane meat, eggs, and dairy whenever possible. By choosing local farmers’ products, you will also keep money in our local economy! Also, skip drinking bottled water when you can. Instead, invest in a water filter to purify your tap water. Bottled water is expensive, but it also generates quite a bit of container waste that hardly ever gets recycled. Instead, bring a reusable water bottle wherever you go (preferably aluminum). This will keep you hydrated, away from unhealthy soda beverages, and save you money on water bottle costs. When it comes to what we buy, we may not realize the impact we have on the world. Try buying items in bulk whenever possible, as these bulk bins often save you money and save companies on the packaging. Also, money allowing, invest in high-quality products that will last for a longer amount of time. While you may pay more now, it will be less likely that you’ll need to replace your items for a while, and there will be less waste to worry about. Did you know that one of the best ways to turn your home into an energy-efficient, environmentally conscious space is to install a solar panel system? 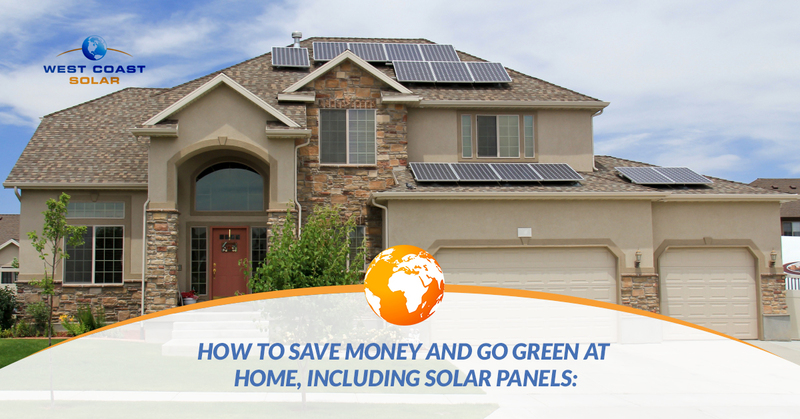 With a solar system on your San Jose home, you can begin storing your own energy and saving more money than you ever thought possible on your electricity bills. It’s time to consider a long-term change that alters the way you run your home for good! Contact West Coast Solar, Inc. today to learn about our various options and financing plans. We look forward to speaking with you and helping you choose the best possible system for your home.